March 19, 2019 Document Management News, News. We gather information in the form of documents in our day to day transactions throughout our organisation. Information on purchases, sales, reports and invoices to name but a few. All of this information is critical to the running of a business but it is how we manage these documents that seems to change as technology advances. With the introduction of GDPR we have become increasingly focused on looking at the personal information we hold. We know that personal data needs to be stored securely so we are more intent on protecting it. Managing our documents in a way that keeps us compliant is a main concern for most businesses. Smartphones and tablets are part of our everyday life. In this new world of fluid working our personal preferences mix into our business life. We expect to be able to get information at the touch of a button or swipe of a screen. Documents that are instantly accessible in a way that is easy to use make our working lives better. If you decide to go digital in our work day it needs to be a process that is sustainable, one that once you start you can continue. An affordable and accessible service is what is required with prices that allow you to be an entrant and remain attractive to keep you as a regular user. Regular document management will keep data safe yet easily accessible. More popular than ever, Cloud storage is easily accessible and understood by most. Storing data in the Cloud means it remains secure and all you need is connection to the internet to access it. Suitable for small sole traders up to big multinationals, cloud is also easy to scale by its flexible nature. Storing documents in the cloud makes financial and operational sense. Managing documents properly will have a positive effect on workflows within the organisation. With a shift towards lean processes and employing best practice, going digital is the best option. Less paper also means less clutter and a simpler way to interact with data. 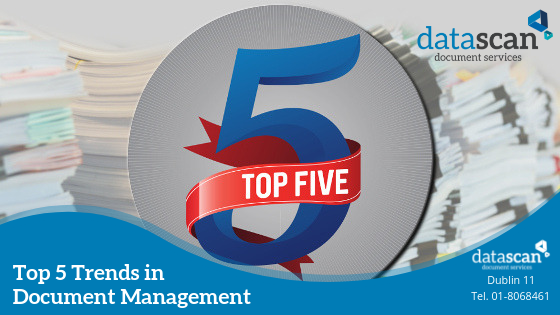 These are all trends we saw emerging last year but they seem to be continuing to dominate the world of document management. It is easy to see why because they all make business sense. Processes such as document digitisation are user friendly, accessible and fit into our day to day working lives. Helping to improve workers lives and improving the bottom line for businesses.